1. 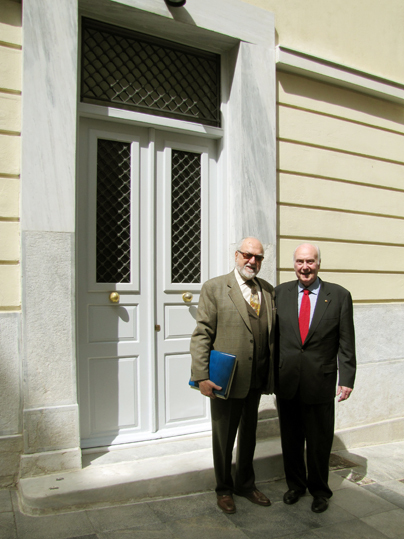 Petros Zoumboulakis meets Chancellor John S. Bailey at the Attica Tradition Educational Foundation, Athens. 2. 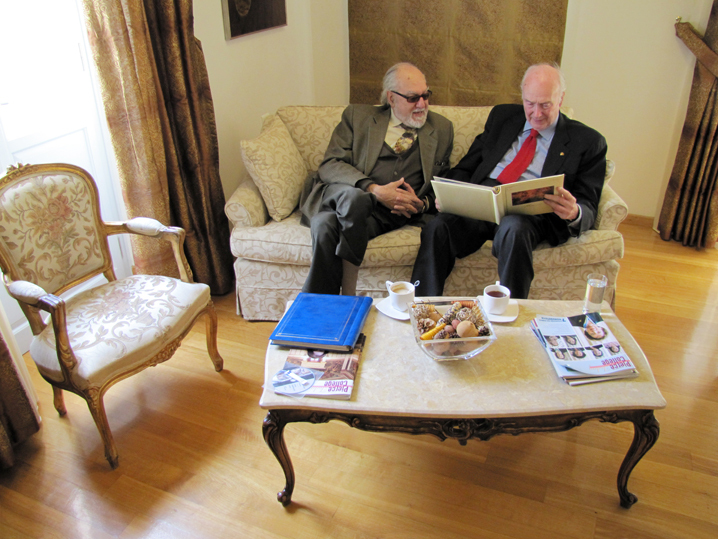 Mr. Zoumboulakis and Dr. Bailey go through previous portraits by the painter. 3. 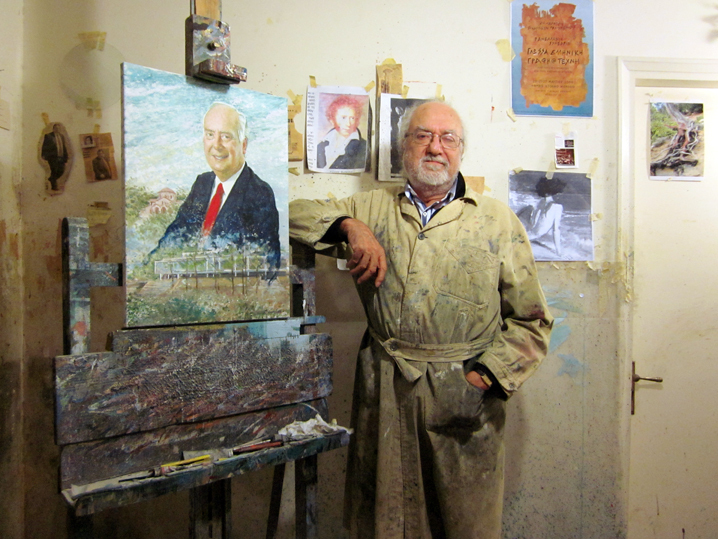 Petros Zoumboulakis with the "Portrait of ACG President Dr. John S. Bailey" at his studio, Athens. 4. The "Portrait of ACG President Dr. John S. Bailey". Petros Zoumboulakis creates the "Portrait of ACG President Dr. John S. Bailey"
Petros Zoumboulakis is arguably one of Greece's greatest portraitists. He studied at the Athens School of Fine Art - ASFA (1956-1964) painting with Yannis Moralis (1956-1961) and stage design with Vassilis Vassiliadis (1962-1964). With support from the Greek State Scholarship Foundation - IKY he studied Byzantine and folklore art in Greece (1964-1965). He had his first personal exhibition in 1970 in Athens, and participated in Panhellenic and other group exhibitions in Greece and abroad already since 1965. In 1971 he received the painting award "Hymn to Liberty". From 1964 to 1986 he taught at the Athens Technological Organization - ATE of Constantinos A. Doxiadis (1913-1975). As stage design and costume designer he collaborated with many theaters in Athens and Thessaloniki. He has illustrated a series of books and magazines as well. His art is concerned with the dialogue between objectivity and abstraction, which complement each other in his work. 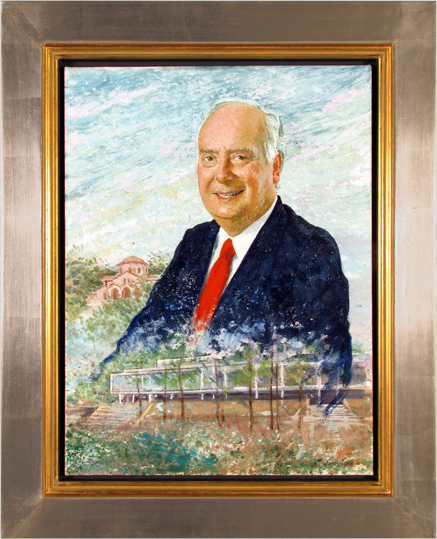 At the suggestion of ACG Art Curator, Zoumboulakis was commissioned to paint the Portrait of ACG President John S. Bailey (1975-2008). Zoumboulakis is interested in portraiture because it penetrates the psychology of the sitter. He had heard of President Bailey before getting to know him personally. He knew that he came from the United States of America to Greece in a top position and that during the course of his term, he appreciated Greece to such an extent that he got assimilated into it and converted to Orthodoxy. This is one of those special cases in which a foreigner is fascinated by both the light and landscape of Greece and the achievements of the Greeks. However, beyond this, the impression of his acquaintance with President Bailey was positive beyond any expectation. This hearty figure, that the photographs portray, was immediately confirmed. Zoumboulakis discerned the depth and quality of Bailey's personality, which combines the essence of the American gentleman and the Mediterranean temperament. Also, the fact that Bailey served in the Korean War (1950-1953), like the brother of the painter, inspired Zoumboulakis to approach his portrait with relational intimacy. Following their meeting, he had already designed the portrait in his mind. Out of many photographs of President Bailey, Zoumboulakis was especially struck by one that presents him with blazer and red tie. He spontaneously thought that this clothing betrays the excellent communicative character of Bailey, who thus semantically refers so directly and openly to the colors of the flag of the USA. Then, observing Bailey's face, Zoumboulakis focused on his eyes, which, as a mirror of the soul, reveal the paternal care for the institution which he led for a period of 33 years. His lips are only just parted, ready for conversation with the viewer. His photogenic physiognomy with the liquid eyes, the rosy cheeks and the sweet smile dictated a palette of soft hues. Zoumboulakis represented President Bailey against a sky that, in its version of scattered clouds, is typically Greek. Its rich color makes the sky refer simultaneously to the blue freshness of the sunrise and pink sweetness of twilight. The present portrait is modern for the additional reason that its lower part is embedded in the landscape. In the left background emerges the Chapel of the Three Hierarchs, beautifully situated on the verdant slopes of Mount Hymettus, which was built by Stefanos Nomikos and was inaugurated by both Ecumenical Patriarch Bartholomew of Constantinople (b. 1940) and Archbishop Christodoulos of Athens (1939-2008) in 2002. Moreover, the bust of the sitter emerges from the library that was built by A. Anthony Tappé, and was inaugurated by President Bailey in 1976 and expanded in 1997. This building, which is a landmark of sustainable and energy-efficient design, bears the name "John S. Bailey Library" since 2008. The Portrait of ACG President John S. Bailey is pioneering for its bilateral style - the realistic depiction of the face's physiognomical features and the loose rendering of the elements of the remaining composition. This technical bilingualism, handled so well by Zoumboulakis, successfully combines the openness that pervades the personality of Bailey with the respect and fidelity that should characterize a portrait. Especially the way the bust comes so imperceptibly from within the building is a rare moment unifying spirit and matter. We look forward to seeing this magnificent portrait hang along the other ACG Presidential Portraits at the Pierce College Theater foyer.